ENGINEERING. PRACTICE. POLICY. 41 June/July 2018 unmanned systems inside "We've already been sent out on one rotation with Texas Task Force 1 after Harvey," Hendrix said. "We went to a FEMA exercise with an earthquake scenario for six days. We f lew the aircraft and provided data. We're even more prepared to assist our citizenry during the next disaster." MORE TRAINING Many drone operators who tried to help after Harvey and Irma weren't trained in disaster response and didn't have permission to f ly. While their intentions were good, they just got in the way. To be effective, those who come out to f ly after a disaster should be working with an organization and tasked with a specif ic mission, and they should also be trained in emergency response. Drone pilots have to know how to communicate w ith f irst responders and how to coordinate w ith manned aircraft. Anyone who wants to help in these situations should take online FEMA courses to learn how incident command is structured, Hendrix said. Operators must be prepared for the conditions as well. Debris, dead animals and any number of Left: Corey Hitchcock preflighting the M600 for a rope pulling mission in Puerto Rico after Hurricane Maria hit. The team used drones to help restore power after the storm. SOUTHERN COMPANY MARIA RESPONSE After Maria, Southern Company used drones to help restore power as soon as possible, said Corey Hitchcock, UAS standardization pilot for Southern Company. To reinstall conductor wires and get the power back on crews typically use helicopters to pull a 210-pound test rope, which is used to pull a heavier rope—which is used to pull the wire into place. In Puerto Rico the wires fell in the woods requiring crews to attach the end of the rope to a backpack and thread their way through the trees—a job that would likely take 10 men a week to complete. Using a drone with a payload release they were able to complete the 2,400 foot mission in about a day. 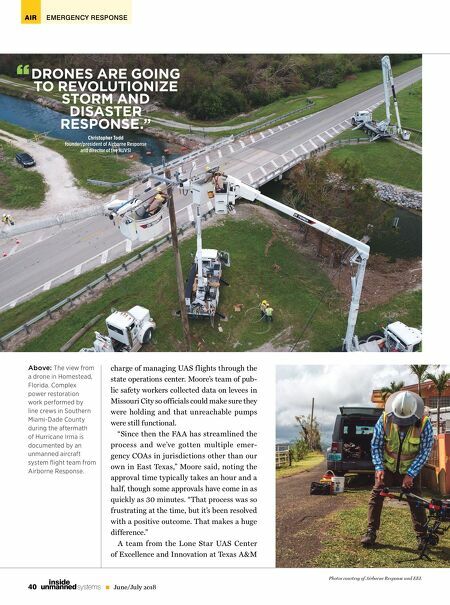 "We spent two months in Puerto Rico pulling 71,000 feet of rope from mountain top to mountain top to get the lights on months ahead of time, saving countless man hours and preventing potential injury from people having to walk through the woods. The longest pull was 2,400 feet from mountain top to mountain top. The line was originally installed with a helicopter but we were able to use drones." University–Corpus Christi, led by Executive Director Jerr y Hendrix, per formed sev- eral missions across Texas in the days and weeks following Har vey, including f lying over the Port of Corpus Christi to identify any hazards that would make opening it un- safe. They also worked with Robin Murphy and her Roboticists Without Borders group, which is part of the Center for Robot-Assisted Search and Rescue (CRASAR) at Texas A&M University. The team deployed UAS in Fort Bend County to survey dams, levees, road- ways and to assess water levels. Though the process was slow at first, they received permission to deploy in areas with temporary f light restrictions (TFRs) and were able to f ly over people and beyond visual line of sight (BVLOS). 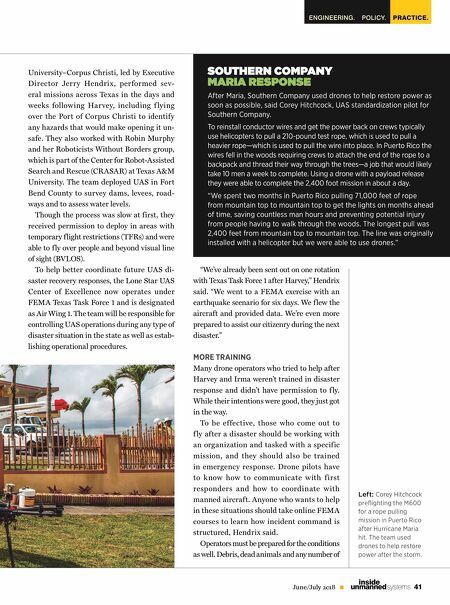 To help better coordinate future UAS di- saster recovery responses, the Lone Star UAS Center of Excellence now operates under FEMA Texas Task Force 1 and is designated as Air Wing 1. The team will be responsible for controlling UAS operations during any type of disaster situation in the state as well as estab- lishing operational procedures.